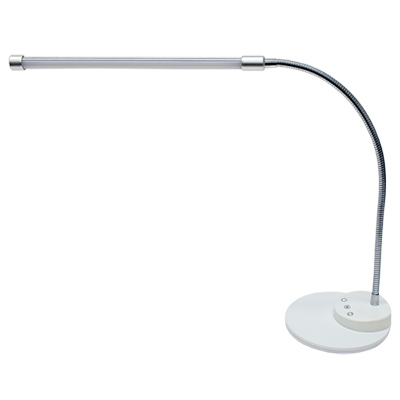 LED table lamp features a built-in USB port and a high-tech on/off and dimming touch control with 3 lighting options: warm white, neutral white, and bright white. 17" flexible arm makes it easy to adjust for each client. Base measures 6" diameter. Includes AC/USB power source, AC plug, 3 ft. USB power cord, and an instruction manual.